After a year of work and myriad revisions, the House passed Tuesday a transportation overhaul bill that renames and restructures the scandal-tainted Utah Transit Authority. The House passed SB136 on a 54-14 vote. It now returns to the Senate for approval of amendments, before likely going to Gov. Gary Herbert for his signature. The bill would phase-in over three years higher registration fees on electric and hybrid cars. By 2021, electric cars would pay an extra $120 in registration fees (above the current $44), and plug-in hybrids would pay an extra $52. However, the bill would allow owners of such vehicles instead to opt into a planned experiment to charge vehicles a fee based on how many miles they drive a year, based on odometer or similar readings. A legislative task force developed the bill to rework how to govern and fund future transportation. For example, it will now allow state highway funds also to be used for transit — but they must be approved not only by UTA but by the Utah Transportation Commission. The bill replaces UTA’s current part-time, 16-member board with a full-time, three-member commission that is designed to better watchdog that agency where public trust was damaged by high executive salaries, extensive international travel and sweetheart deals with developers. “Here’s my favorite part of the bill: At any point of time, the governor can fire any of these members,” said Rep. Mike Schultz, R-Hooper, House sponsor of the bill. The legislation limits the salary of new trustees — nominated by local counties and appointed by the governor — to $150,000 a year each, plus benefits. Legislative analysts predict the new full-time board plus staff will cost $1.2 million a year. A late change also requires the agency to transition to use legal counsel from the Utah Attorney General’s office, which Schultz said could save the agency hundreds of thousands of dollars a year — and provide more state oversight. The bill also would rename UTA as the Transit District of Utah. Sen. Wayne Harper, the bill’s sponsor, says that would help show the agency has changed and is starting anew to rebuild trust. Schultz said UTA has told lawmakers the name change could cost $50 million to change signs and repaint vehicles. He scoffed at that high estimate and said, “that shows the concerns we’re dealing with a now at UTA,” and said the bill allows changing signs over time as the agency can afford it. The bill once proposed to force counties to impose Prop 1 sales taxes (of a quarter-cent per dollar) rejected by voters in Salt Lake and Utah counties in 2015 — largely because of controversy over UTA scandals. Now the bill allows those two counties to pass Prop 1 taxes by 2022, or they lose the ability to impose them forever. If they don’t pass the tax by 2019, it allows cities in those counties to pass their own versions — and keep half for local roads, while half would go to transit. Bedeviled that none of a long series of proposed tax hikes will fly this election year, lawmakers exorcised most of them Monday from a transportation overhaul bill that now focuses mostly on restructuring the scandal-tainted Utah Transit Authority. Sponsors say it’s a bit like building a car without an engine, but no one can yet agree on the type and size of engine needed. “Is it valuable without the funding? Absolutely. Is it better with funding? Yes,” said Sen. Wayne Harper, R-Taylorsville, sponsor of SB136. Future tax increases are inevitable to fund needed transit and highway projects, Harper said, but this bill allows more time to debate and refine them. SB136 still has one increase — quadrupling the registration fees on electric vehicles that now escape gasoline tax. And it gives counties incentives to raise their sales tax for transportation. The House Transportation Committee approved such changes and voted 9-1 to advance SB136 to the full House. Removed are once-proposed huge tax hikes on rental cars and hotel rooms, and a more recently proposed 64 percent increase on car registration fees. Supporters hoped varying mixes of these provisions would have generated about $80 million a year. Harper said he wanted to generate that much annually to start to make a dent in transit and highway projects needed to handle a projected doubling of the population in coming decades. UTA President and CEO Jerry Benson testified that his agency cannot afford much beyond what it does now without higher taxes. The bill would still phase in higher registration fees on electric and hybrid cars. By 2021, electric cars would pay an extra $120 in registration fees (on top of the current $44), and plug-in hybrids would pay an extra $52. However, the bill would allow owners of such vehicles instead to opt into a planned experiment on charging vehicles a fee based on how many miles they drive a year. Such fees may eventually entirely replace gasoline taxes, which have dwindled as cars have become more fuel efficient. Ashley Soltysiak, director of the Utah chapter of the Sierra Club, was among many who opposed that fee hike. “We need urgent action to clean our air now, and firmly believe that imposing a fee of this magnitude on electric vehicles sends a wrong signal.” She called the move irresponsible. The bill once proposed to force counties to impose a sales tax increase of a quarter-cent per dollar purchase — the same tax rejected by voters in Salt Lake and Utah counties in 2015. Now the bill allows those two counties to bypass voters and impose those sales tax increases by 2022. It would rename the agency, after an amendment on Monday, to “Transit District of Utah.” Harper has said that would show it is “a new day” at the agency, and major changes are happening there. The name change would be phased in over time as it is able to afford rebranding and changing signs. The bill would make numerous changes to the structure of UTA, after years of complaints about high executive salaries, extensive international travel and sweetheart deals with developers. UTA’s current part-time, 16-member board representing various local governments would be replaced with a full-time, three-member commission appointed by the governor. The idea is to create more oversight and accountability. The bill would limit the salary for the new commissioners to $150,000 a year, plus benefits. Under provisions of the restructured agency, state highway money could be used to pay for transit, although such spending would require approval of both the transit agency and the Utah Transportation Commission. To help erase memories of its scandal-tarred past and shift focus to coming changes, the Utah Transit Authority could soon have a new name: Transit District Utah. But that is not the biggest change in rewritten legislation to reorganize the agency and change how Utah will fund future transit and highways. SB136 now also would raise registration fees on each car in the state by at least $28 a year — and up to $78 for electric cars — to generate an extra $80 million a year for transit statewide. The Senate barely passed the latest version of SB136 on Wednesday on a 15-12 vote, and sent it to the House. While the funding portion of the plan remains contentious, the long-controversial restructuring of UTA is now generally settled and generates little debate. In the latest version, the Senate removed a once-proposed doubling of state taxes on rental cars to help fund transportation, and also abandoned a proposal to increase hotel room taxes ninefold. Those two tax increases were seen as a way to raise revenues by targeting tourists instead of local taxpayers during an election year — but ran into heavy opposition from the tourism industry. 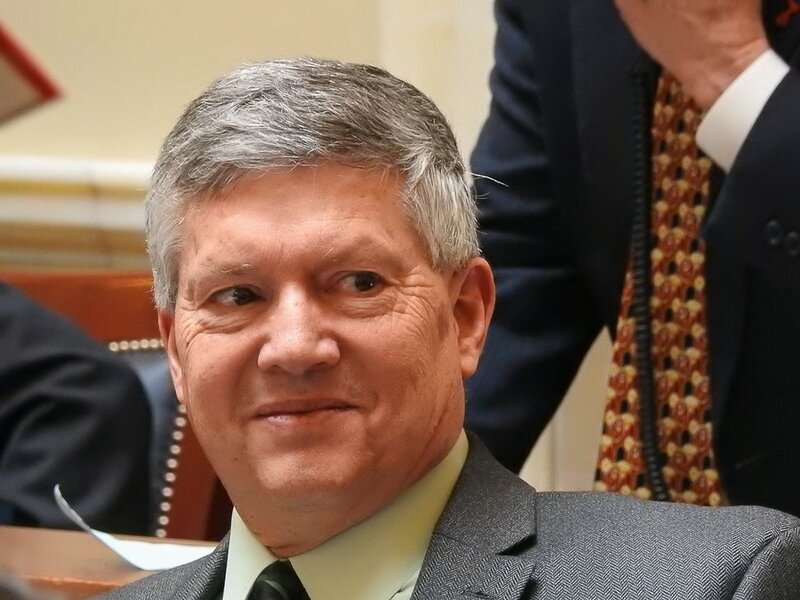 So the bill’s sponsor, Sen. Wayne Harper, R-Taylorsville, initially replaced them with a proposal to hike the state’s sales tax by 15 percent of a cent — also difficult in an election year. Late Tuesday, he dumped that in favor of raising car registration fees to generate the same $80 million in revenue. For most vehicles, fees would rise from the current $44 a year to $72, an increase of 64 percent. But electric vehicles — which escape the state’s gasoline tax — would see registration fees shoot to $122, and plug-in hybrids would rise to $52. With the fee hikes, lawmakers could tell constituents they did not vote for a tax increase for transportation this election year. Money from higher registration fees would go into a fund used to improve highways. But the bill would divert an equal amount of sales tax revenue now going into that fund into a new one for transit improvements statewide. That would reduce a sales tax subsidy for highways. The original bill — developed by a yearlong legislative task force — would have automatically triggered a 2022 transportation tax hike that residents in Utah and Salt Lake counties rejected at the ballot box in 2015, largely because of scandals at UTA. The bill now would give counties the option until July 1, 2022, to impose that tax, or they would lose the opportunity to do so. Harper said it would not mandate that transit portions of that tax hike would go to UTA, but could go to city transit projects or for private companies that may bid against UTA for some services. Sen. Jake Anderegg, R-Lehi, has argued for such flexibility, saying it could have led Utah County to approve the 2015 tax increase known as Proposition 1. Also, the bill would allow individual cities in Utah County and other counties of the second class to hold elections to impose part of the Prop 1 taxes — a tenth of a cent — to help fund local roads. Under the bill, state funds previously reserved for highways could be used for mass transit. But major capital projects for transit would need to be approved by the Utah Transportation Commission in addition to UTA. Aside from the shifting funding provisions in SB136, it proposes major structural changes to UTA. Those include replacing the current 16-member, part-time UTA Board with a full-time, three-member commission to more closely watchdog the agency’s executives. And then there’s the proposed name change to TDU. Sen. Lyle Hillyard, R-Logan, asked in debate if the bill would lower the infamously high salaries of some UTA officials. Harper acknowledges that it may be difficult in an election year to pass a bill with $80 million in fee hikes. If Harper’s tax proposals run into trouble, a possible “Plan B” bill for transportation funding is also proceeding. House Majority Whip Francis Gibson, R-Mapleton, introduced HB423. It also could allow state lawmakers to say they did not personally raise taxes — but the bill would authorize counties to impose increases without voter approval. The House Transportation Committee endorsed HB423 on Tuesday, but Gibson said it would be cast aside if Harper’s bill passes. A major overhaul of the scandal-scarred Utah Transit Authority no longer appears controversial. But what is contentious are several tax increases in the same massive bill that seeks to plan the future of Utah transportation. Even some taxes seemingly designed to avoid problems with local taxpayers in an election year — by instead targeting out-of-state visitors with higher taxes on hotel rooms and rental cars — brought plenty of opposition on Monday. Still, the Senate Transportation Committee voted unanimously to endorse SB136 and sent it to the full Senate for consideration. But Committee Chairman Gregg Buxton, R-Roy, warned, “This is a bill in process,” and plenty of work is needed, especially on proposed taxes. Several members warned they will not vote for the bill in the full Senate unless many of the currently proposed taxes are lowered or removed. Among the most controversial is a proposal to raise registration fees on electric vehicles from $44 to $194, and the fees on hybrid cars to $65. Sen. Wayne Harper, R-Taylorsville, the bill’s sponsor, said such vehicles escape all or much of the state gasoline tax now. The higher registration fees are designed to be about what similar gasoline-powered cars would pay in gas tax, and would help ensure that the electric vehicles pay their fair share to maintain highways. Trent Nelson | The Salt Lake Tribune Sen. Wayne Harper, R-Taylorsville, in the Senate Chamber in Salt Lake City, Friday February 3, 2017. But some groups and lawmakers argued it would take away any financial incentive to buy higher-cost alternative-fuel vehicles at a time Utah is trying to reduce air pollution. Ashley Soltysiak, director of the Utah chapter of the Sierra Club, said less than 1 percent of Utah cars are now electric. Sen. Jim Dabakis, D-Salt Lake City, agreed — and proposed an amendment to eliminate those higher registration fees. Harper opposed it, saying he’s still negotiating changes and it is too early in the process to totally eliminate them. After Sens. Karen Mayne, D-West Valley City, and Jake Anderegg, R-Lehi, warned they would not vote for a final version of the bill with such high fees, Dabakis withdrew his amendment — saying it sent its message, and he expects that negotiations will eventually lower or remove the higher fees. Also controversial are proposals to double the tax on rental cars and raise a tax on hotel rooms more than ninefold to help fund mass transit and highways. The car rental tax would go from 2.5 percent to 5 percent. The hotel room tax would go from 0.32 percent to 3 percent. Kaitlin Eskelson, executive director of the Utah Tourism Industry Association, said that would make Utah taxes much higher than surrounding states, and could send conventions and visitors elsewhere. For example, the room tax in Park City would be 15.45 percent and it would be 15.28 percent in Salt Lake City. She said competing areas are lower, including 9.8 percent in Vail, Colo., and 8 percent in Jackson, Wyo. — and 12.57 percent in Phoenix and 12.5 percent in San Diego. Billy Hesterman, vice president of the Utah Taxpayers Association, also questioned if it is fair to raise hotel room tax for transportation. Harper insisted it is a user fee, because people going to hotels use roads. Ed Fowler, representing Enterprise rental car, said that industry already pays the highest sales taxes in the state. He said they total 16.35 percent now, and when airport fees and taxes are added they rise as high as 42 percent. He also said two-thirds of people who rent cars in the state actually live here. Also controversial in the bill is a proposal that if counties don’t raise their local sales taxes for transit and transportation to the full penny per dollar allowed, the state in 2022 will automatically impose it. “We already voted on this. We said no,” complained George Chapman, a former Salt Lake City mayoral candidate, referring to how taxpayers in Salt Lake and Utah counties in 2015 rejected Proposition 1 to raise such taxes because of mistrust of UTA. “Let us not forget that UTA is $2 billion in debt,” said Heather Williamson, Utah director of Americans for Prosperity. “And this is after years of controversy over ridiculously high salaries for executives, lots of expensive international travel, sweetheart deals with certain developers [and] being investigated by the federal government.” She opposed the tax hike. The bill aims to reorganize UTA to rebuild trust after past problems. It would replace its part-time, 16-member board with a full-time, three-member commission to better watchdog the organization. UTA Board member Bret Millburn, who is also a Davis County commissioner, said the agency now supports that. “We want to continue to partner because we see the big picture” of what transit means to Utah’s future. Another large change in the bill would allow state highway funds also to be spent on UTA projects. No one opposed that, while UTA, counties, cities and others said it is needed to help solve problems as Utah’s population grows. Carlos Braceras, executive director of the Utah Department of Transportation, said, “In the next 30 to 40 years, we are going to double our population. In this urbanized area, we are not going to double the lane miles that we’re going to build,” so UTA transit will become increasingly important.